The election of the Republican Donald Trump as US President has generated an impact in the world markets, If Trump governs in accordance with the campaign that got him elected, we can expect market scares in the United States and around the world, as well as potentially significant economic damage. 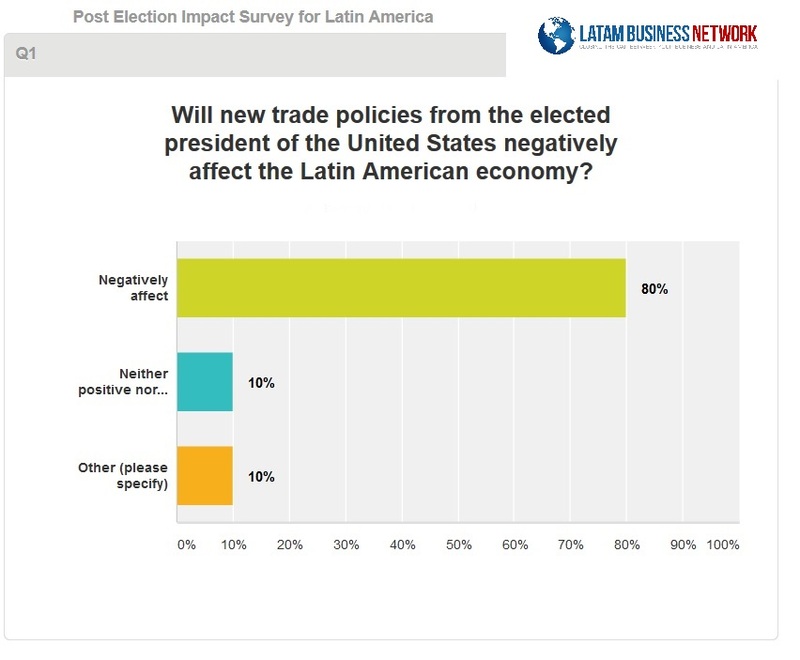 But, in which extend Latin America can be affected. Uncertainty looms over NAFTA. Mr. Trump has called the agreement “the worst trade deal in history” and promises either to renegotiate it or abrogate it. He has talked of slapping a tariff of 35% on Mexican exports to the United States. Trade wars and rising tariffs could severely disrupt American supply chains: the American car industry relies heavily on component suppliers in Mexico. Mr. Trump wants to slash the headline corporate-tax rate from about 40% to 15%, at the same time as removing a myriad of exemptions that allow businesses to dodge their bills. He also wants to make it possible for companies to bring home the $2trn or so of accumulated profits they have stashed abroad, without triggering a huge tax bill in America. The weak Mexican peso has already pushed up the inflation rate. Mexican peso suffered strong volatility around the U.S. presidential election. Mexico is likely to depress foreign investment (2.6% of GDP in 2015). Due to higher inflation and interest rates that could cause a recession. Risk in Mexican infra sector may rise in 2017 due to Trump presidency. In Mexico and according to Fitch, the Volume growth in transportation assets is expected to be modest as a result of weak economic prospects for 2017. “Increased trade protectionism in the U.S. could lead to contractions in traffic of toll roads with significant commercial purpose”. Source: Fitch. The Trans-Pacific Partnership (TPP) agreement one of the most important “or dangerous” as described by the Economist, looks to be dying. Last 21, November; President-Elect Donald Trump declared he would make good on his promise to pull the United States out of when he takes office in January 2017. 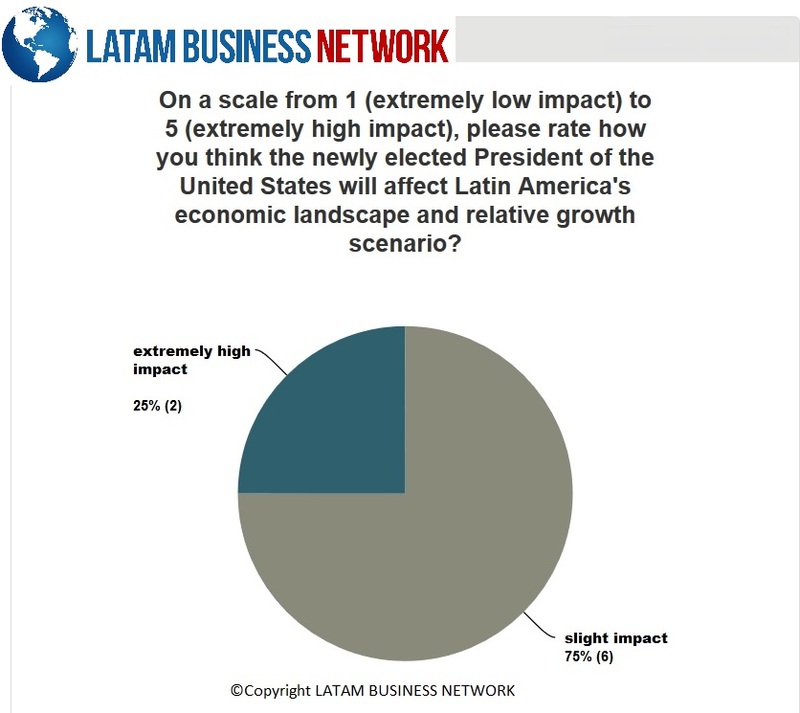 Our survey confirmed that the conservative strategy expected to be implemented by the US elected president, will certainly affect the Latin America Economy. The high dependence of Mexico to US as a trade partner is forecasted to be mostly impacted, as already shown with the instability of the exchange rate, and the recently announced Fitch ratings in infrastructure modest growth and weak economy. During the performance of our survey, Mr. Trump confirmed the US exit of the Trans-Pacific Partnership (TPP). Guarantying an strong market protection. 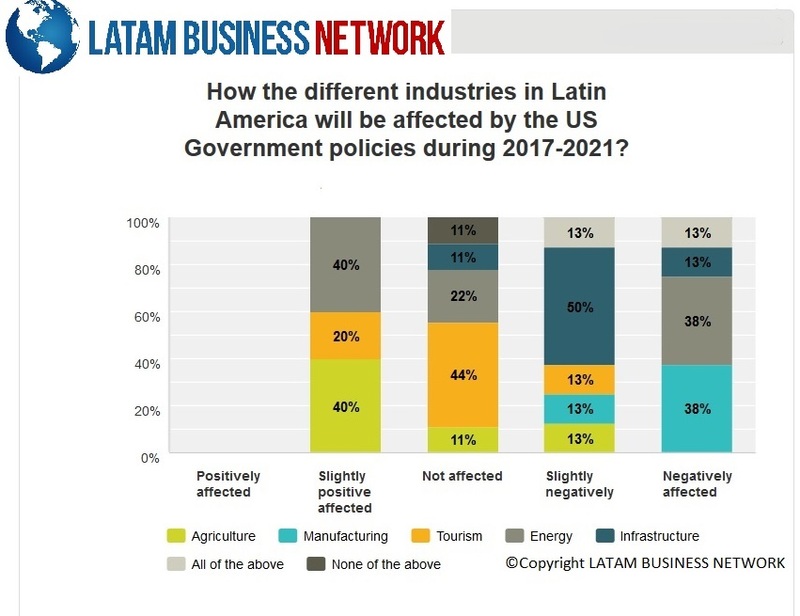 But we at LATAM BUSINESS NETWORK, Keep positive. When a door is close new ones are open, and the inter-Latin American commerce should be further analyzed based on current and successfully initiatives like the Pacific Alliance Free Trade Agreement which allows to looking towards Asia. Bilateral agreements with the EFTA allowing to trade with Switzerland between other developed economies. Also for Swiss companies having free trade agreements with Asia, the limitations of trading with US may bring further opportunities. Please share with us your opinions?